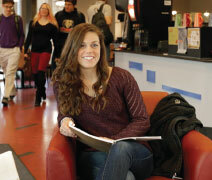 King’s College gives you the tools to succeed while you’re here and long after you graduate. A variety of majors, special programs, and unique experiences help you discover your passions and develop the core of who you are. Small classes ensure personal interactions with faculty and access to résumé-building opportunities. It’s all part of a caring environment where you’ll find supportive professors, impressive coaches, and friends for life. We invite you to explore what King’s has to offer. A King’s education is a four-year “laboratory” that helps you discover what you are passionate about while preparing you for your professional career. Our CORE curriculum is grounded in the liberal arts and designed to help students explore a variety of subjects to help them find the interests that will let them flourish for the rest of their lives. This broad-based approach to learning encourages students to explore the past and question the future, helping them develop critical-thinking and communication skills that are in high demand in today’s workplace. Forbes ranks King’s as one of “America’s Best Colleges” in recent listings; U.S. News & World Report has ranked King’s among “America’s Best Colleges” for 22 years straight. 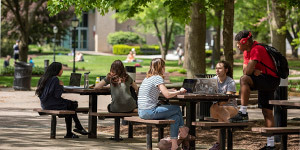 Our academic programs are accredited by the most respected agencies, including AACSB International (the Association to Advance Collegiate Schools of Business), the Accreditation Review Commission on Education for Physician Assistants, the Commission on Accreditation of Athletic Training Education, the American Chemical Society, the National Council for the Accreditation of Teacher Education, and the Middle States Commission on Higher Education. • 99% of King’s graduates are employed or attend graduate school within six months of graduation. • King’s alumni are leaders is such fields as nuclear medicine, cardiology research, and materials science and include a Tony Award–winning Broadway designer and top executives at Fortune 500 companies. They form a strong professional network of support for job-seeking graduates. • Internships, student teaching abroad, and experiential learning opportunities annually place 200 students around the globe for experiences that employers value. • King’s offers Civil and Mechanical Engineering degrees and a unique 3+2 Engineering Dual-Degree Program in collaboration with the University of Notre Dame. • Our new Exercise Science major offers students the opportunity to study the sciences of health promotion, wellness, and fitness. • Undergraduate programs with the most majors at King’s are Accounting, Biology, Business Administration, Criminal Justice, and Physician Assistant Studies. • Beginning in the spring of 2018, King’s will offer two Nursing options: an RN to Bachelor of Science degree and a 1-2-1 Dual Degrees in Nursing (DDN) path that allows students to earn RN and Bachelor of Science in Nursing degrees in four years. • The new King’s on the Square facility is the state-of-the-art home for the College’s highly regarded Physician Assistant Studies Program, the top-accredited Athletic Training Education Program (ATEP), and the new Exercise Science Program. • King’s residence halls offer a variety of living arrangements, from single rooms to apartments, all wired for internet access. In the halls there are 24-hour computer labs, lounges with cable TV, and laundry rooms that text you when your clothes are done. • The library offers computerized databases and provides access to research libraries across the United States. • Student activities enhance classroom learning. There are diverse social, cultural, and recreational opportunities in more than 50 clubs and organizations. • The Sheehy-Farmer Campus Center provides such meal options as a takeout café and marketplace dining. Features include an internet café, an art gallery, a conference center, a courtyard, and a waterfall. • There’s a lot to do off campus too. Visit an arena with its own ice hockey team and a stadium with professional baseball. You’ll find outdoor sports for all seasons in the nearby Pocono Mountains. Cultural events include art and musical presentations, films, lectures, and performances. • King’s offers 27 NCAA Division III athletic programs for men and women as well as a variety of intramural sports. The Scandlon Physical Education Center features a state-of-the-art sports medicine facility, three multipurpose courts, an Olympic-size swimming pool, handball and racquetball courts, and wrestling facilities. The McGrane Gymnasium accommodates seating for 3,200. The Betzler Fields Athletic Complex features fields for baseball, field hockey, football, lacrosse, soccer, and softball on 33.5 acres, plus a fully equipped field house. • Most first-year students receive financial aid from King’s, and over 70% of the average aid package is in the form of gift aid. Students may receive assistance in the form of federal, state, and institutional aid and private sources via scholarships, grants, loans, and work-study. • King’s offers numerous private scholarships and grants that are unique to our institution. King’s also offers deferred payment plans, which allow families to make monthly payments on the balance of tuition, fees, room, and board, less any financial aid received.